at Sutter's Mill? 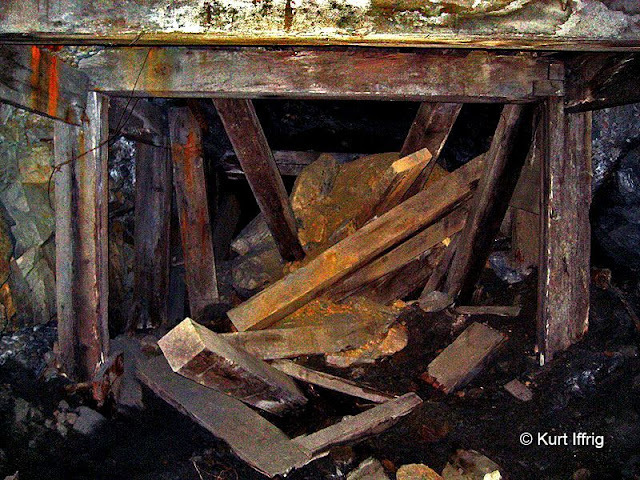 This website is dedicated to the discovery, documentation & preservation of these legendary mines. Stamp mill housing where ore from the mine was crushed. Originally there was a 10 stamp mill inside. Years of Operation: 1895-1906 Brief renewal in 1934, again abandoned in 1936. Mapped, surveyed and very briefly re-opened in 1937. Main Tunnels: Surveys in 2002 and maps from 1916 indicate a combined length of over two miles (11,500 feet) 8,700 currently mapped plus another 3,500 feet which are now either clogged or sealed by cave-ins. Midway Tunnel: I have been about 500 feet into this mine. At that point there is a 90% cave-in, but it appears to go much deeper. Although it is located about a mile from the stamp mill housing this mine may actually connect to Big Horn's main tunnels. Fenner Tunnel: 402 feet, plus another 450 feet beyond a currently collapsed end. There is also an upper level which has never been measured. 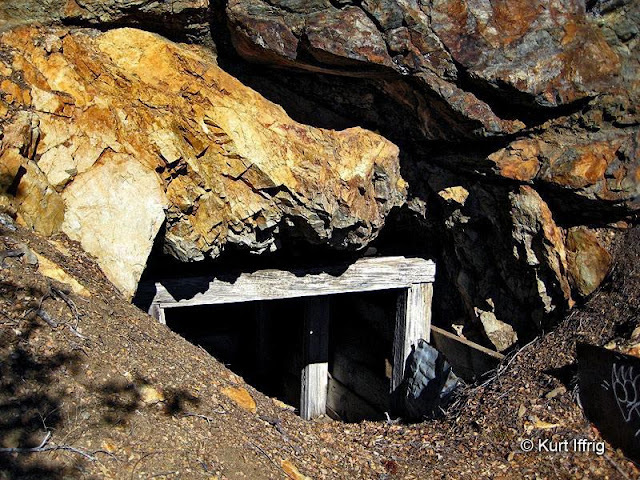 Inside the enclosure there is a heavy two story ore hopper, behind the original stamp mill location. The Big Horn Mine is worthy of its own website. 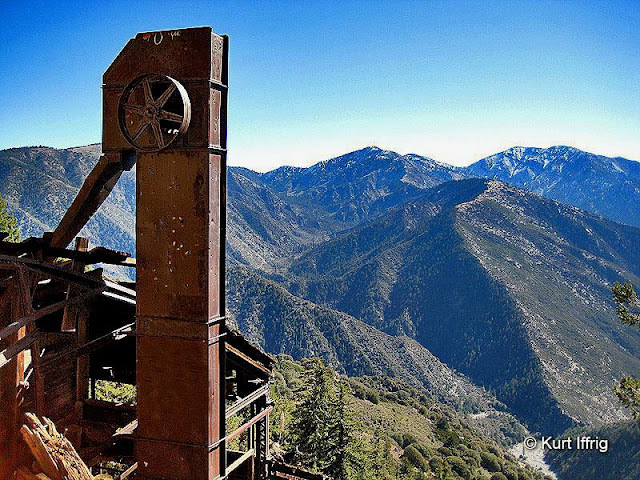 Named after the majestic Bighorn Sheep that still roam this area, it is by far the largest abandoned mine in the San Gabriel Mountain range, with a long and colorful history to match. Located deep beneath Mt. Baden Powell, it has been estimated that all tunnels combined measure well over two miles in length. The mighty Big Horn is one of my many unfinished projects in the exploration of mines in the San Gabriels. In the future I will be exploring the Fenner Tunnel far below. Here's a photo of the stamp mill housing in 1935. Inside the building on the left was a two story ore hopper. In 2002 the late adventurer Hugh Blanchard and his team took on the nearly impossible task of mapping Big Horn Mine. Hugh’s team included Dell Quick, Dave Kuha, Donny Quick, Bill Liebmen and Kevin Singleton. My apologies if I left anyone out. Their final map showed 8,700 feet of tunnels (roughly 1.5 miles). However in 2003 the L.A. County Fire Dept. Search and Rescue Unit obtained an original set of maps dating back to 1916 from the Dept. of the Interior. These maps revealed that there were a substantial number of additional tunnels, as well as other levels that Hugh’s team was unaware of. Merging the maps together added an additional 3,500 feet to the mine, areas that are now clogged or behind cave-ins. This does not include smaller nearby tunnels associated with the Big Horn. Unfortunately Hugh was killed in a fall near Castaic Mine in 2008, a great loss to many. Blanchard’s extensive work and research has not been forgotten, and many other explorers including myself have become inspired to carry on his legacy. Tom Vincent aka "Dougherty" near his hunting cabin. His trusted 50 caliber Remington rests against the tree. Amazingly Vincent's cabin still exists, hidden in the woods. These walls were once lined with animal pelts. 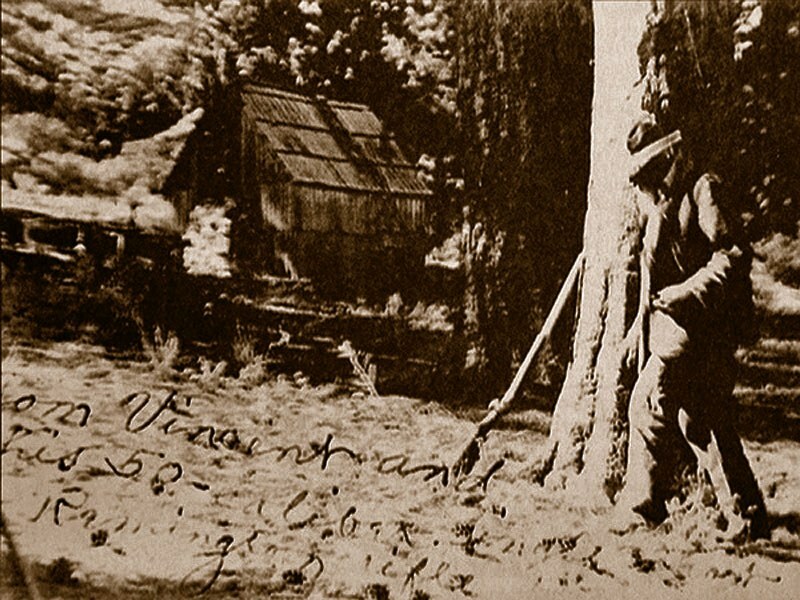 Charles "Tom" Vincent had a reputation as a sharpshooter, rumored to have killed three charging grizzlies in one encounter. Yes, back then the San Gabriel Mountain range was crawling with grizzly bears. 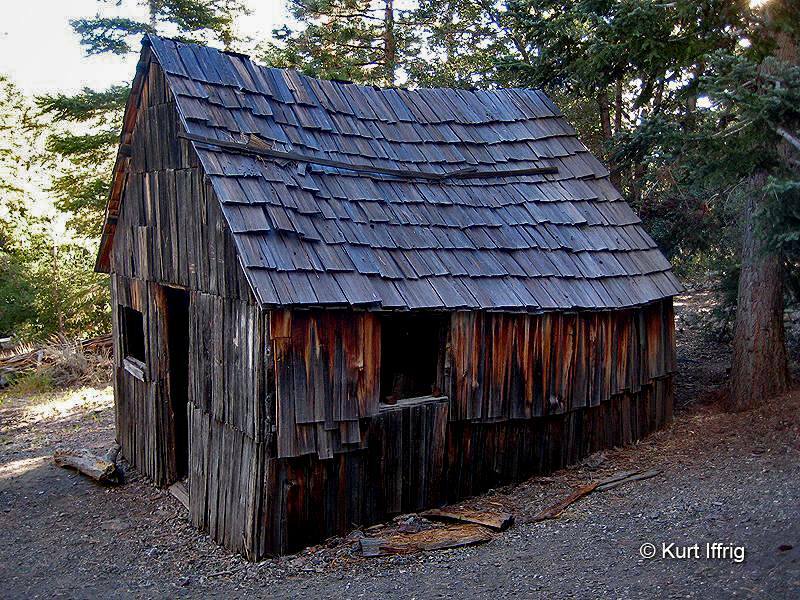 Years before, Vincent and a mining partner from Arizona killed three men they found ransacking their cabin. All three men were buried on the spot. In 1868, Vincent and his friend Lockwood bolted to California. 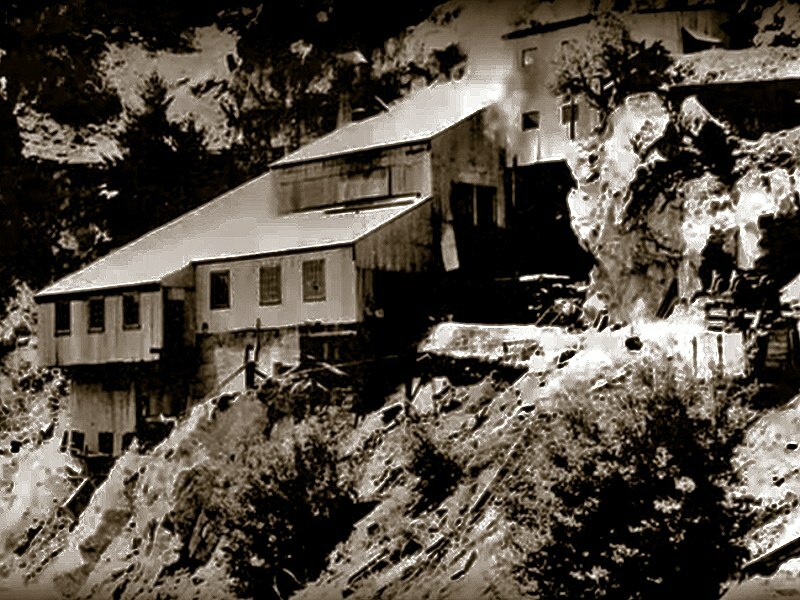 Vincent took on the false name of Charles Vincent Dougherty and moved deep into the San Gabriels, where he remained secluded for most of his remaining life. Volunteers have painstakingly replaced the hand cut shingles on Tom's cabin. The frame is original. After his gold discovery, Tom partnered with two other men, Civil War buddy Charles Locher (Lockwood) and prospector N.D. Shippy. Tunnel #1 was bored into the mountainside where more gold was found. Unfortunately Vincent and his partners could not afford to fund the extremely expensive process of crushing and hauling out the ore, so after three years they sold the mine, keeping only two nearby claims called Blue Cat Mile and Little Nell Mile. Vincent later gave the title of these two mines to Levi and Dorothy Noble of Valyermo, CA. This loader was used as an elevator to lift ore to the top of a two story hopper behind a ten stamp mill. On his deathbed in 1926 Vincent revealed his true identity, expecting to be held accountable for the men he had killed more than 30 years prior, but was allegedly told that he had never been wanted by the law. Today the Vincent Gap still bears his name, as does Vincent Hill, in the far away Santa Clarita Valley. Vincent's cabin remains to this day, hidden away from view on a forested flat. Vincent's body is buried in the veteran's cemetery in Westwood, CA. under his false name, Vincent Dougherty. 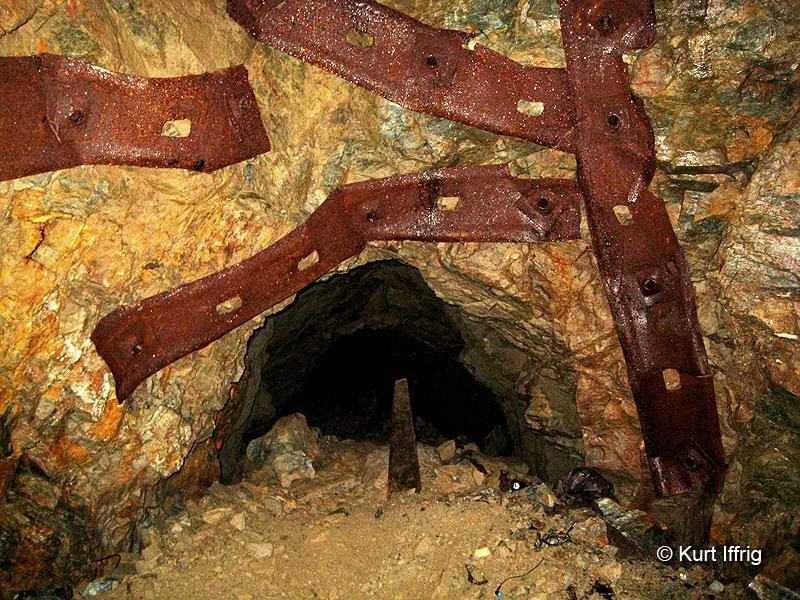 This is the lower portal to the Big Horn's main mine. This risky entrance has a major collapse inside. Who did Tom Vincent sell the Big Horn Mine to? That's a bit of a mystery. Three sources give three different answers. According to Dennis Nadaline of the Mountaineer Progress it was purchased by the Lowell and California Mining Company. This was the company that carved out a rough wagon road, that ran all the way from the Big Horn Mine around the slopes of Mt. Baden Powell, across Vincent Gap, down Big Rock Creek and finally ended in the town of Valyermo. This road was completed in 1903, and some stretches of it still exist, though much of it has been washed away. This ownership claim was supported by the Siskon Corporation, the last known owners of the mine. Inside the lower tunnel is a long corridor of shoring with a major collapse. This is not a good entry point. Other sources disagree with the ownership of the mine after 1901. In 2006 the Wrightwood Historical Society received a letter from Norman Lamb, president of the California-Engles Mining Company. He reported that the mine was bought by Colonel F.C. Fenner and was later maintained by his widow Cora, after his death in 1917. This claim seems to have the most credibility, as the tunnel far below the main tunnel bears Fenner's name. It is said that Fenner's Tunnel, also known as Tunnel Number 5 had its own two stamp mill and operated for a year and a half. 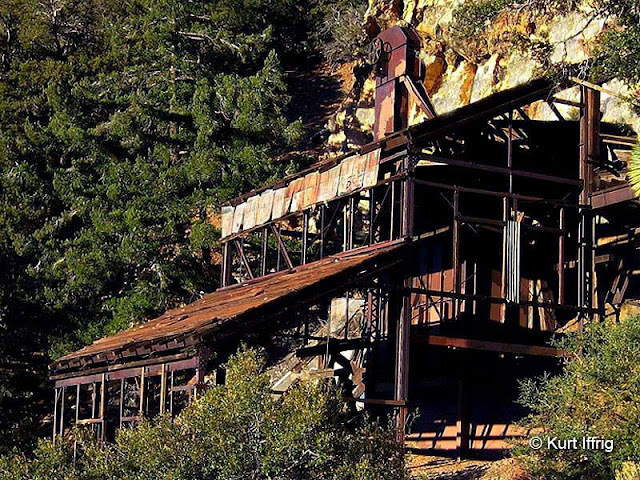 This mine was attached to the Lowell and California Mining Company, which was based in Arizona. 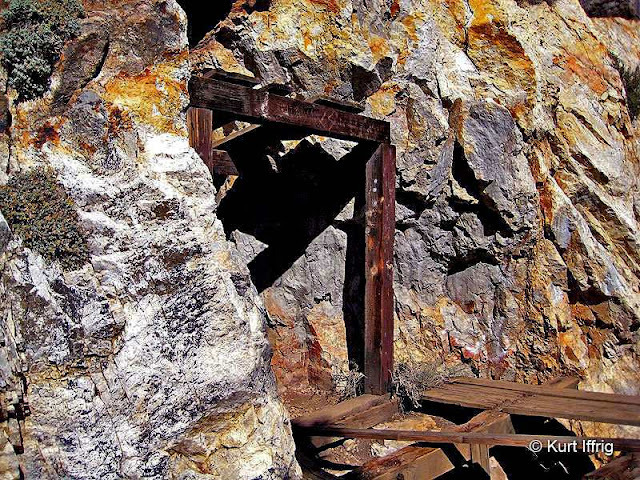 The upper portal is located behind the stamp mill housing. Inside the upper and lower tunnels converge. In a third, less credible account Author Bobbi Holmes of the Mountain/Hi Desert Guide wrote an article in 1987 quoting an article from the L.A. Times that was written during that time period: "F.V. Layton is now the manager of the Big Horn Mining Company of this city. It is capitalized for $2,000,000 and owned by Senator S.W. White, Judge F.M. Ross, L.W. Blinn, J.A. Graves and a few others, all of Los Angeles ...". This report seems unlikely, given the fact that the Big Horn Mine only brought in a total sum of $100,000 in gold during its entire history. This is the junction of the upper and lower tunnels. The tiny white specks are daylight from both portals. Regardless of who owned the mine at that time the Big Horn boomed from 1903-1908. 50 men were employed, and a small community was built where the miners stayed. For a short time Tom Vincent continued to work for the new owners. The miner's community included a store and telephone lines that ran from Valyermo for phone service. Some remnants of this settlement can still be found on the way to the mine. For the first year and a half a two stamp mill was used to crush ore. After that a 10 stamp mill was erected outside of the diggings, from which ore was hauled out by large horse-drawn wagons to their destination in Valyermo, in the Mojave Desert. 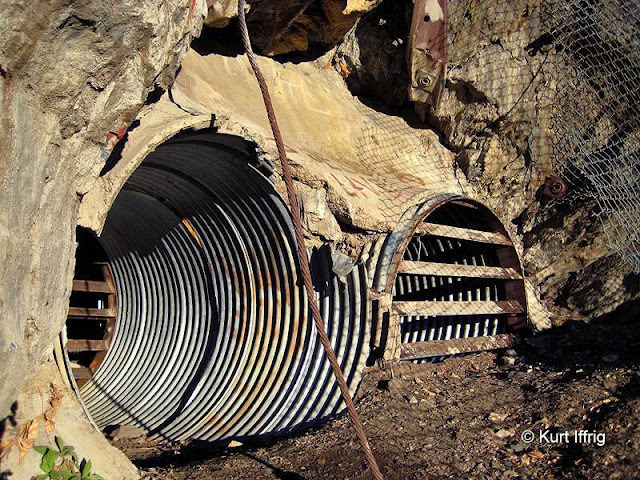 A total of ten tunnels were developed during the Big Horn's golden era. Between July of 1904 and October of 1906, 15,564 tons of ore were mined and treated at the mill. At $2.25 a ton, it brought in over $38,720. The stacked beams in the center are called cribbing. Hugh Blanchard called this the Lincoln Log Room. 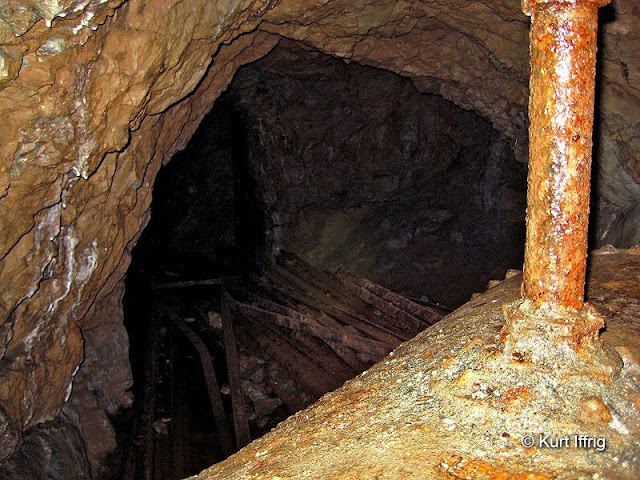 From 1908 - 1914 the mine property was in litigation and remained idle. In 1914, Mudd and Weisman conducted exploratory work on a new tunnel, dubbed the Fenner Tunnel. After one year this effort proved futile and was abandoned. The Fenner Tunnel still exists, but is heavily shored up and unstable. After Col. Fenner's death in 1917, his wife Cora maintained the property, but the mining operations stood idle until 1934. In that year Mrs. Fenner granted a lease to R. Huffman - The Big Horn Mining Company. These saturated beams are losing their integrity. The numbers on the wall are found throughout the mine. By 1934 Big Horn Mine looked nothing like what Tom Vincent and his partners had started 36 years before. It now consisted of 15 claims and 2 patented mill sites. Huffman's company found a 25 foot quartz vein. A new tunnel measuring 1450 feet was bored, promising an average market value of $4 per ton. At least 25 employees worked the mine. A diesel plant and compressor were installed, as well as a 50 ton flotation plant. The miner's settlement became permanent and a power line was installed on the property. Outbuildings and the old mill building were upgraded and the road leading to the property was improved. This company seemed poised for success, but the operation went belly up by 1936 when a continuous production routine could not be maintained. Looking up one of the Big Horn's vertical shafts. 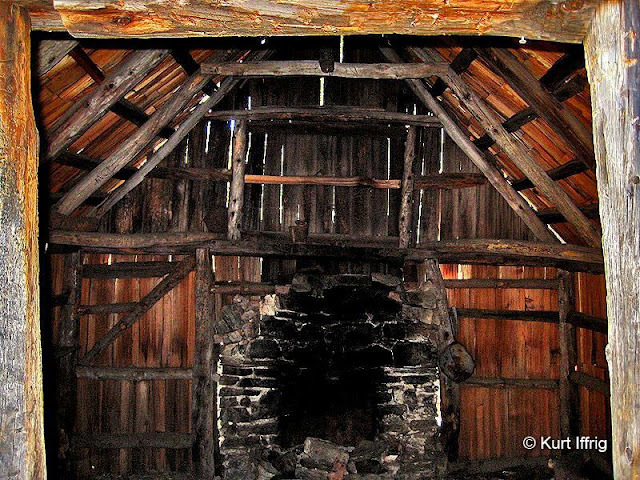 The wooden framing was probably an ore elevator. In 1937 the property was leased with an option to buy to the American Metal Company Limited of New York. They conducted a massive examination of the mine, including geological mapping, tunnel surveying, obtaining samples and drilling eight new exploratory tunnels. This company's role in production was brief. 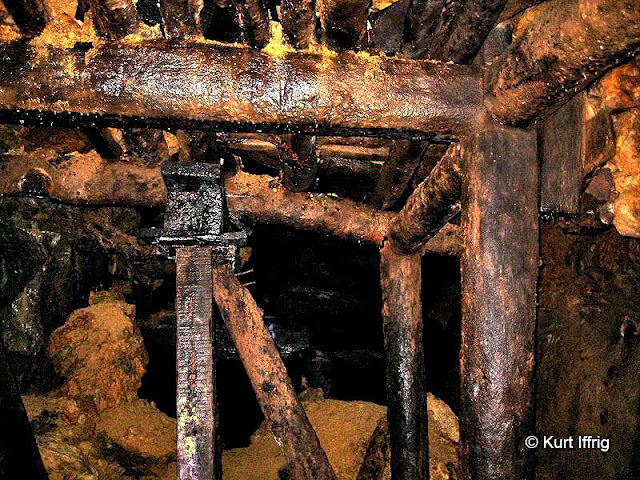 The mine opened only briefly and then was closed again. 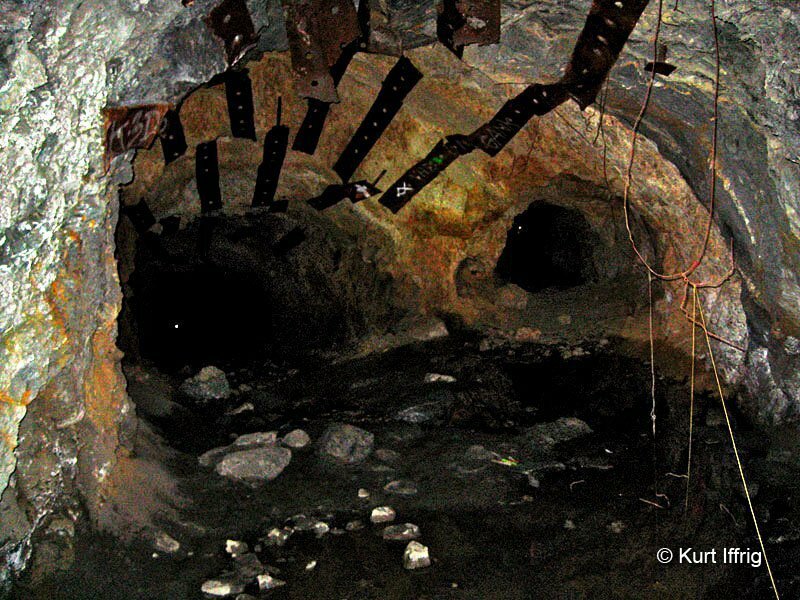 This is one of the older tunnels in the mine. Overall the support beams are still holding strong. In 1938 the mine was sold to Security Industrial Corp (SBI), owned by H.B. Chessher of Nevada. This company did not conduct any mining operations and later transferred ownership to an associated company called the Siskon Corporation in 1966. The only known activity by this company was general maintenance and minor exploration and sampling in 1980 and 1981. The consensus of these later owners seemed to be that there was still gold in the mountain, but the time, money and effort to get out out were not worthwhile. One final mining related ownership transfer was recorded in 1981, when the Siskon Company and all of its assets were sold to the Hanna Mining Company of Cleveland, Ohio. There was no recorded mining of the Big Horn by this company. There are many shafts leading to upper levels, but this is the only one I found with a partial ladder. In 2006 a conservation group called the Wilderness Land Trust purchased 277 acres of the Big Horn Mine from the Siskon Corporation. This purchase was made for preservation, not profit. 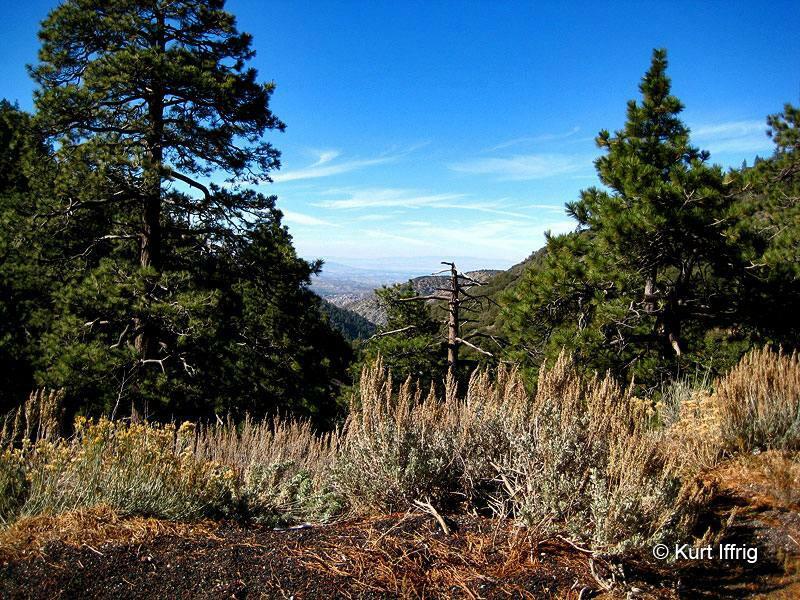 This group had liability concerns and finally transferred title to Angeles National Forest authorities in 2011. Trust president Reid Haughey reported with a hint of satisfaction, "Taxpayers got this slice of paradise for a bargain price: $2 million." It is estimated that today the Big Horn Mine still holds 262,000 ounces of gold. This section probably dates all the way back to the 1800s. Numerous cave-ins prevented further exploration. This mine features a long labyrinth of tunnels measuring well over 2 miles in length, however at least 3,500 feet are located behind risky or impossible areas to reach. This is a multi-level mine with two portals, and numerous shafts. The lower entrance has a long corridor of heavy shoring, but has experienced a major collapse and is unsafe to enter. At one point the upper and lower tunnels converge, and the tunnel becomes large enough to drive a truck through. A hidden storage area behind an old water tank. I found a few of these in my exploration. Another tunnel emerges on the left side, which leads upward in several different directions to a second and even a third level. There are multiple tunnels that dead end at cave-ins along the way, and unfortunately there's also a massive amount of graffiti. It seems that the people who came before me were so paranoid of getting lost that they painted arrows on every wall and hung guide strings along the way to help them find their way out. 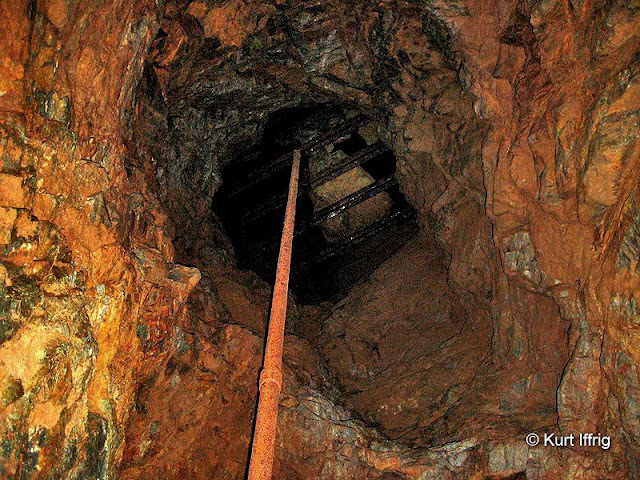 On the upper levels there are some dangerous vertical shafts that are up to 70 feet deep. These are called straps. 8 foot deep holes are drilled into the rock and rods are pounded in to secure them. If you continue straight instead of exploring the side tunnels you will enter a cavernous area nicknamed the "Lincoln Log Room" by the late Hugh Blanchard. This room has a huge slab ceiling, partially supported by cribbing. To the left of this room are other gigantic, but dangerous open areas. If you continue straight from the Lincoln Log Room you will enter a very old area supported by weakened timbers. I would estimate that I was able to explore about 70% of this mine. Perhaps I will try some of the more risky areas at a later time. 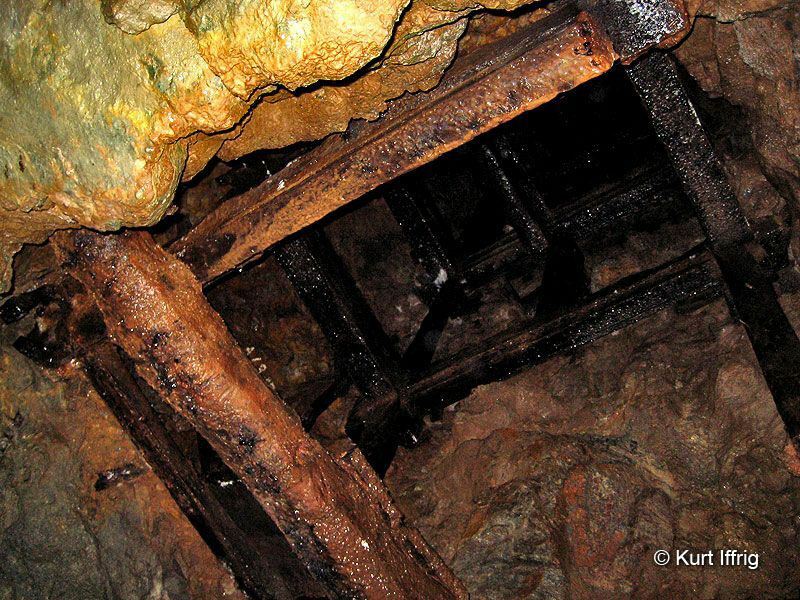 The grating placed above this shaft is preventing huge rocks from falling down on the first level of the mine. Just to the left of the stamp mill building there is an old trail that leads to an storage shed buried in manzanita. Shortly after the shed is one of Tom Vincent's small claim's, which he held onto after the Big Horn was sold. 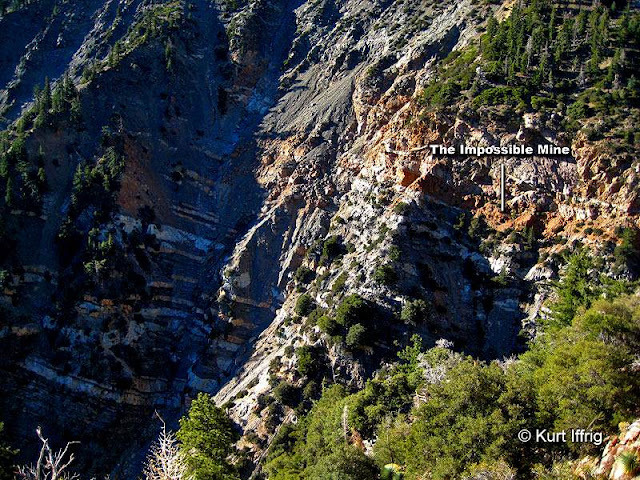 From there the trail quickly fades, and becomes harder and harder to follow, eventually leading to an extremely exposed and dangerous ledge along the edge of a cliff. I don't recommend going this far, but if you do you'll be able to see one of the two mines I may never get to see, far across the deep gorge. This small prospect was once owned by Tom Vincent. It is either the Blue Cat Mile or the Little Nell Mile. I nicknamed this the "Impossible Mine" because there appears to be no way to get there. 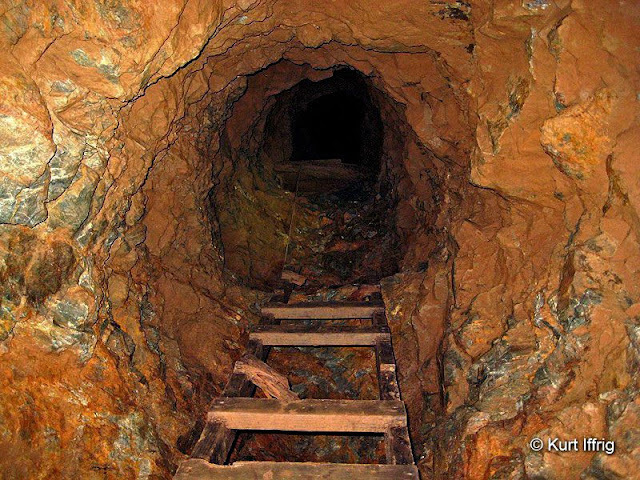 This mine has been identified as the Oak Knoll Mine, also known as the Oak Knoll or Bunker Hill Claim. Actually there is a way to reach it, but it would take a lot of planning and dangerous climbing to get there. From this vantage point you'll also have a fantastic view of Mt. Baden Powell's backbone, which sometimes becomes a spectacular overhanging cornice in the winter. All that stands between you and the Impossible Mine is an area I call the "Walk of Death", a narrow ledge along the edge of a cliff with a l00 foot fall if you should happen to slip. If you get past that point a myriad of other obstacles begin. The actual name of this mine is the Oak Knoll or Bunker Hill Claim, but I call it the Impossible Mine. Over the decades I've hiked throughout the San Gabriels, but this area ranks in the top five of wildest and most spectacular. 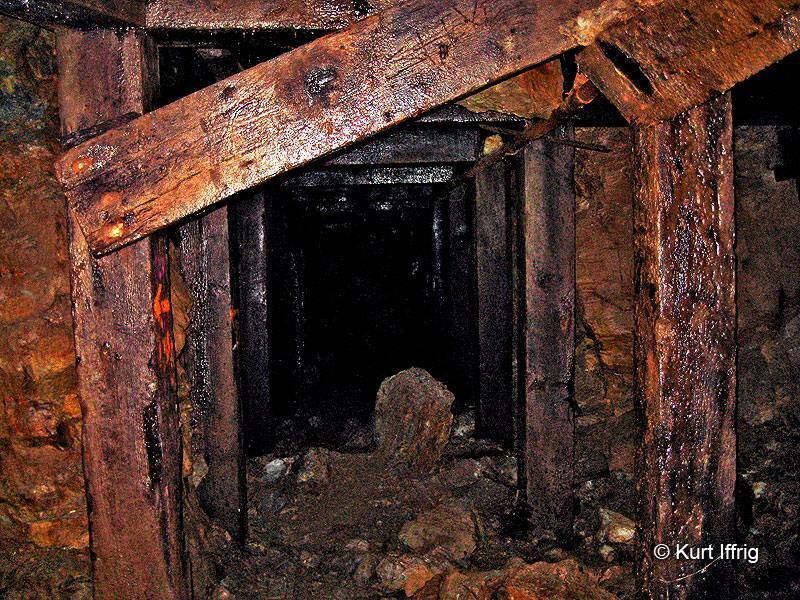 After finding and exploring a number of old mines you begin to understand and appreciate the hardships that miners must have gone through over 100 years ago. 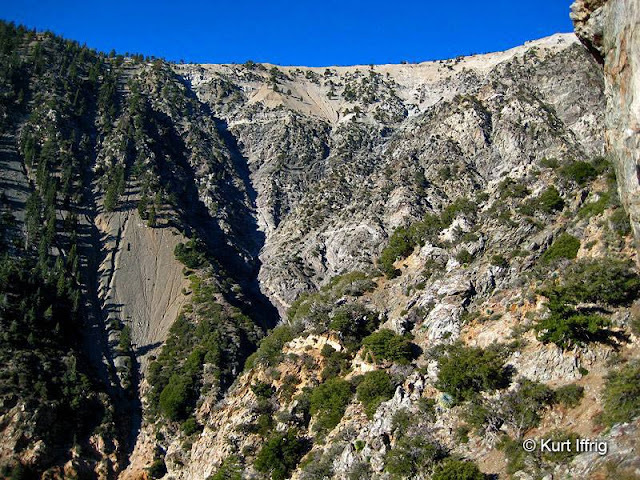 The Angeles Crest Highway would not be available to the public until 1956, so all of the equipment had to be hauled in by mules or horse-drawn wagons. There were no stores, no cell phones, no GPS, virtually no law, and if you were unfortunate enough to get injured, you were on your own. Did I mention that grizzly bears once roamed this range? This is the backbone of Mt. Baden Powell. The light streak in the lower center is an old washed out trail. 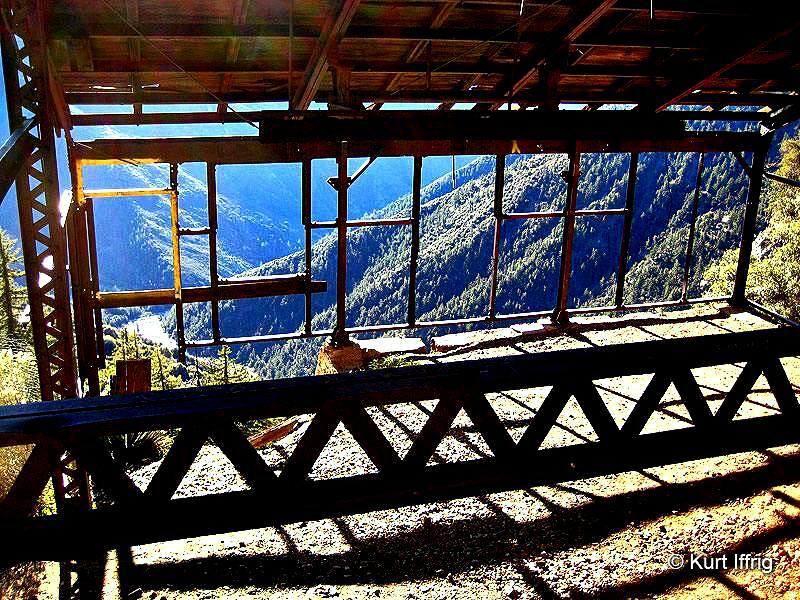 Exploring the Big Horn Mine has been a time consuming project. So far I've been there four times, and will probably need to visit two more times to complete my exploration. Aside from the Impossible Mine (it's real name is the Shoemaker or Bunker Hill Claim) there is the Fenner Tunnel, located far below the main one, near an area called Prairie Fork. 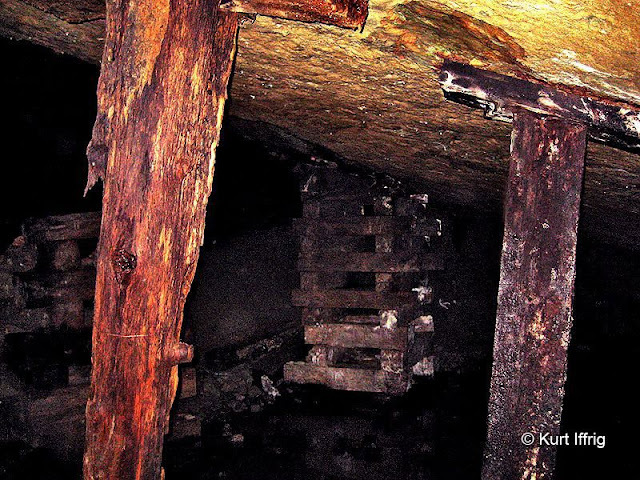 This was a one year mining venture conducted by Col. Fenner in 1914 that was unsuccessful, but the unstable mine is still there. And there's a large tunnel I've nicknamed the Midway Tunnel on the way to the stamp mill housing. I have recently entered this tunnel, and gone in about 500 feet, at which point there is a 90% cave-in. There's also an old plane wreck on the mountainside just above the valley floor. So stay tuned, if I live long enough I'll be adding more photos in the future. A view from Vincent Gap to the desert below. A wagon road once stretched from the Big Horn to Valyermo. All watermarked photos are copyrighted and cannot be used without my consent. I do not give mine locations or routes to reach them on this website. This is to discourage taggers and looters from vandalizing these historical relics. 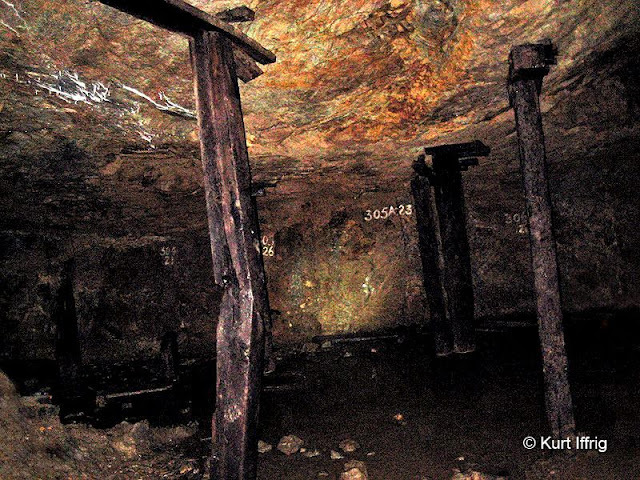 If you wish to visit these mines you will have to do your own research, as I did. All watermarked photos are copyrighted and cannot be used without my permission. This site is for entertainment and informational purposes only and I do not endorse or encourage the exploration of these mines. All mines are potentially dangerous to enter. Copyright Kurt Iffrig 2019. Watermark theme. Powered by Blogger.